Replaces female circlets with a more elegant and delicate model. Beta. 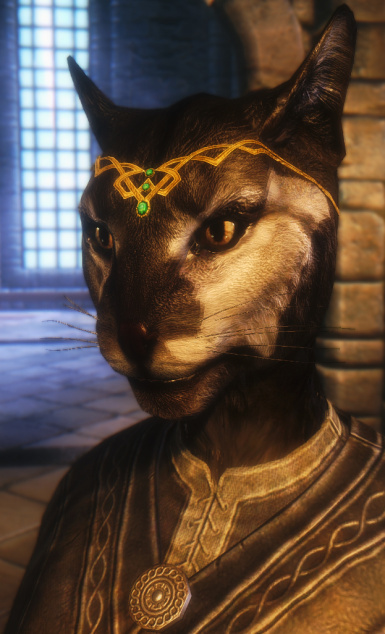 For khajiits, you may notice some clipping with extreme brow morphs (pushed very far forward, pushed very close together...). All I can do is advise that you tweak your morphs slightly if this is an issue. I have already remodeled the circlets several times and I am reluctant to change it much more. I like the shape, ya know? 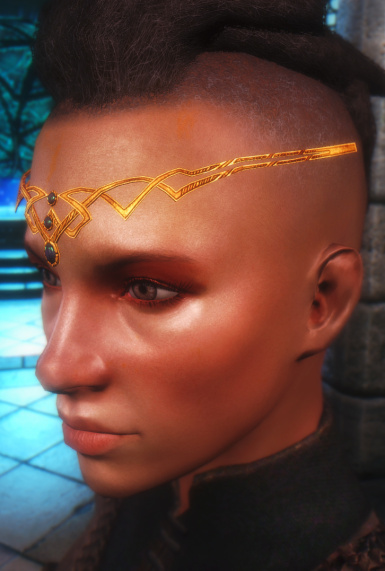 I have never been completely satisfied with the vanilla circlet models. I've always felt they were much too "chunky" and did not look appropriate for my female characters. This mod endeavors to change that. 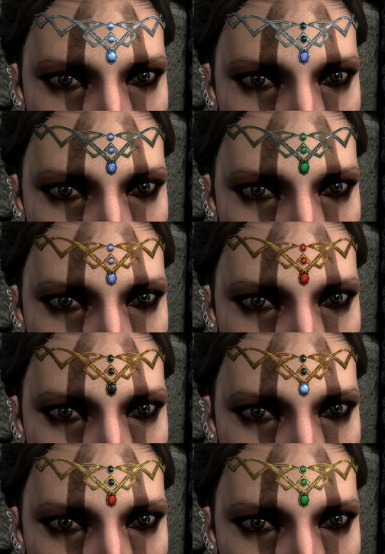 I have replaced all ten female circlet variations with my own custom mesh and hand-painted textures. The design features three settings for stones - so you'll still have all the combinations you are familiar with..... only prettier! At the moment, they will only replace the models for human, khajiit, and elven races. Argonian support in-progress! Download, unzip, and drop the files into your data folder. Done! Download and install! Remember to enable the .esp. Select "yes" if prompted to replace files. Download, unzip and drop the files into your data folder. Enable the .esp. Select "yes" if prompted to replace files. Simply uninstall the old version and install the newer one. If asked to overwrite files, choose "yes". No "clean saves" necessary. Unzip, and drop the new files into your data folder. When asked to overwrite, choose "yes". 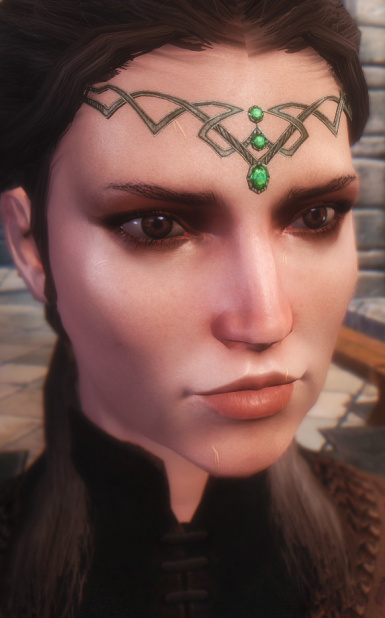 There is still a gap between the circlet and the character's forehead. I have adjusted the fit to the best of my ability while avoiding clipping on any races.. 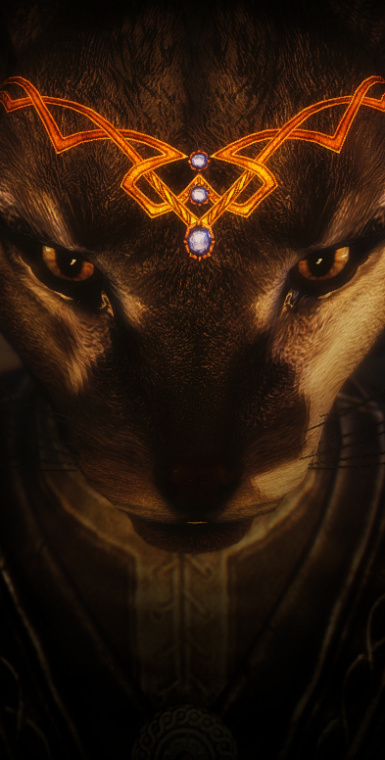 There is some clipping with extreme brow morphs on khajiits. Please adjust your morphs if this becomes an issue. The ground objects in the standalone version use the vanilla meshes. These are only placeholders, and will be replaced when my meshes are finalized. After I am satisfied with these replacers, I want to make a few stand-alone items featuring new materials and alternate meshes! I already have created diamond, amethyst, opal, obsidian stones, and an ebony material. I hope to also work with daedric (complete with glowy stuff! ), and even dragon bone. If you have any suggestions, let me know! Also, you can have a look at this forum topic for some sketches of new designs. These files may not be re-uploaded on the Nexus or other sites. These files are not a resource. If you wish to alter them in any way or use them in another mod, please contact me. Bethesda for giving us Skyrim. The teams behind Blender and Nifskope. 3ds Max for being awesome. The modding community for all the great tutorials. The skin texture in my screenshots is created by Nuska. The eye textures are a simple recolor of Xenius' work. Beatuiful work by these two. <3 Kitty cats have been given a makeover with Cover Khajiits! 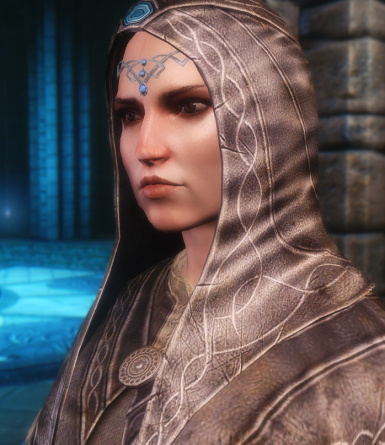 Also, my screenshots were taken with Seasons of Skyrim ENB. Really wish I could play the game that way!